My final two Variety stories for this Oscar season not only recap the nominees but look at the races in historical terms. Four of the five nominees in each music category (song and score) are first-timers to the competition. And in the score category, most of the composers didn’t go the traditional route of simply recording live musicians — they added electronics, processed and modified the score, or otherwise used avant-garde recording or post-production techniques. It’s a big change from the old days of Steiner, Korngold and the classic Hollywood sound. And for the song story, I investigated what Academy voters consider when voting. What is a “best song,” anyway? 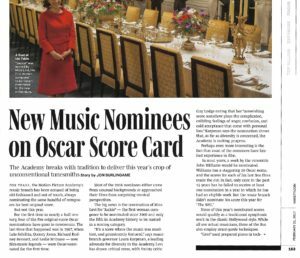 This entry was posted in Composers, Film Music, Interviews and tagged 2016 Oscars, Academy voters, choosing best song, how do Oscar voters choose winners, new scoring techniques, Oscar music, Oscar music nominees, Oscar songs, Variety on February 22, 2017 by Jon Burlingame.